In this edition of homify 360 we head to the Netherlands, where a fantastic traditional home has received a chic modern facelift. The expert team at Bongers Architects took on the revamp project, creating a modern country home for a young family while retaining much of the shape and characteristics of traditional Dutch homes. The house blends in with the natural environment, making it the perfect fit for a countryside cottage. The home has generous interior space as well as a fenced off outdoor area, which will make a great space for a small farm holding! The fantastic team of architects with over 25 years of experience have met every request of the owners perfectly! Let's take a closer look! We begin our tour today with a view of the backyard. 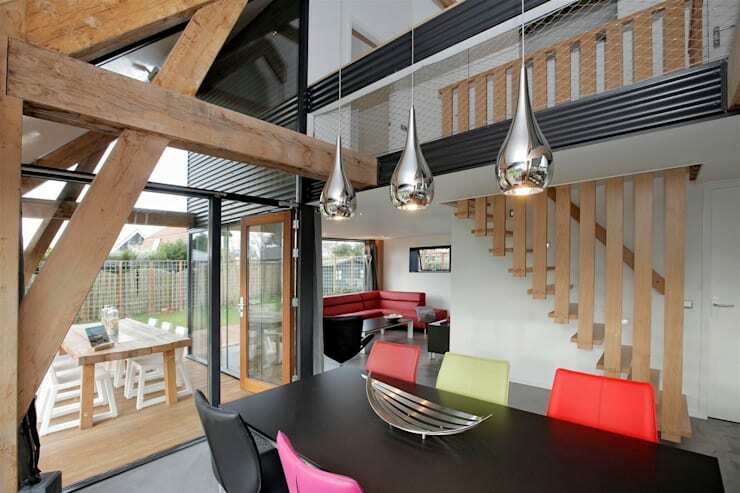 Here we catch a glimpse of the fantastic exterior that is an extension of the interior living space. This angle of the lovely cottage boasts a wooden deck space, great for entertaining! Have breakfast while taking in the morning air! The wooden dining table and chairs is the perfect fit for this outdoor space, adding a touch of modern design to this countryside cottage. The traditional shape of this home was preserved but a modern and trendy edge was added to create an even more fantastic design! So while the exterior of this home has a strong modern appeal with a traditional angle, the interior maintains a similar approach. The abundant use of exposed wooden beams and neutral tone of the natural local wooden banister adds a creative yet rustic style to this dining room space. The modern angle is achieved through the black dining room table and black metal that extends from the outside to the inside of the home, while the polished steel lamps add just enough illumination to create a comfortable dining experience. Completing the decor of this room is the brightly coloured dining chairs, which adds a definitive modern edge to the interior! Urban splash of colour… achieved! The living room of this home is comfortable in every respect. From the large and relaxing red sofa that looks so inviting, to the windows located all around the living room for maximum natural sunlight and ventilation. The beautiful minimalist fireplace that is sure to warm up the interior along with the underfloor heating for those extra cold days! Insulation and temperature control are of utmost importance in this home! 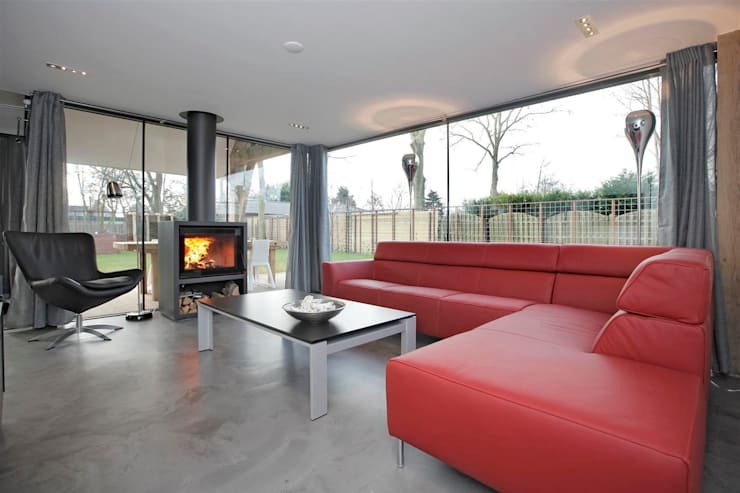 With double-glazed windows keeping the warmth in during the colder days, while creating the perfect space to enjoy the sunshine and night's sky! Looking for ideas to add more comfort to your living room? Then these: Tips to create a really cosy living room might be just what you are looking for! 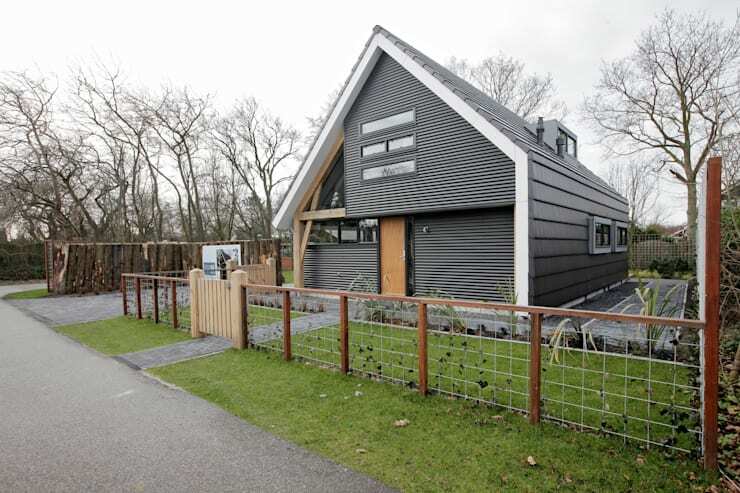 We end our tour of this magical chalet in the Netherlands today with a view of the front façade! 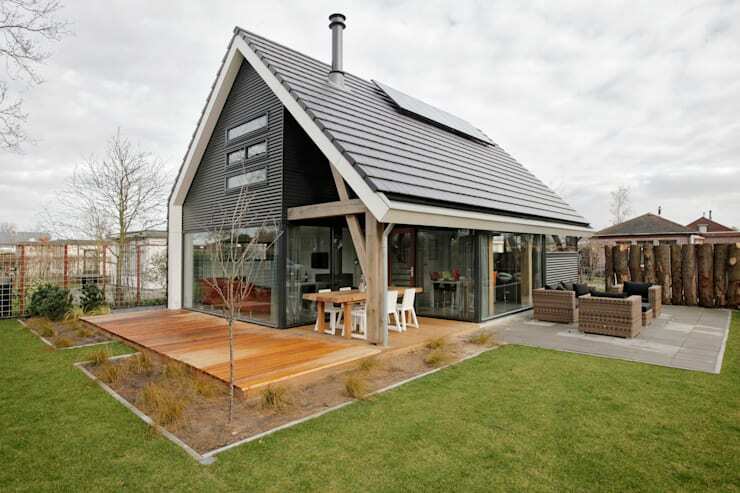 The modern home may look like a traditional country cottage, but instead of being built from wood, it is built from aluminium! Now that's taking modern living to the next level! The well placed windows create a light and bright interior atmosphere, while the darker tone of this home exterior makes it a fantastic futuristic space too! How about that cute fence surrounding the property and the tall trees in the background… almost eerie isn't it? Have you considered a countryside home? Do you like this house? Let us know your thoughts!